2011 Development, introduction and patent application of HotMove ® - technology. The revolutionary tool concept for the economical production of 2K, 3K and 4K articles. Consistency pays off: Third Participation in the competition, Excellence in Production '. Finalist: WIRO. Completion of the new hall as a gap closure. Scissor lift up to 5 tons. 3 cranes with up to 7 tons. "WIRO: Tool Maker of the Year 2008". "WIRO: Tool Maker of the Year 2006". 1998 Creation of additional capacity through acquisition and expansion of the adjacent building. Expansion of manufacturing capacity through the construction of a new production hall and the putting into service of state-of-the-art machine tools. Concentration on the manufacture of maintenance-free, high-performance tools for closure components, with a cycle time guarantee. 1979 The company moves to its current site, not far away, in Olpe. Production of tools for closure components is gradually increased. Export orders grow continually as a result of participation in international plastics trade fairs. 1978 First orders from abroad, in cooperation with injection moulding machine manufacturers. First tools for the manufacture of closure components. First participation in a trade fair outside Germany. 1977 The first injection moulding machine for the proving of tools. 3 machines with a clamping force of up to 320 tons are now available for the proving of all tools (mainly 32- to 96-cavity). 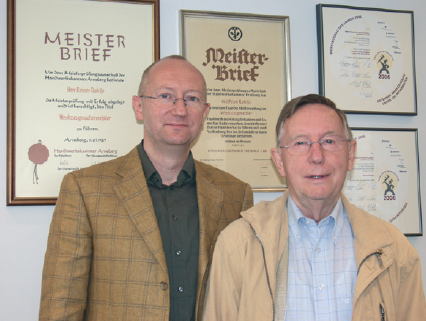 1975 Wilfried's son Reiner starts his apprenticeship as a toolmaker within the family business. In 1985, he becomes a master toolmaker and a shareholder in the firm, which has since gone on to become a private limited company with a customer base that extends across Germany. Its core expertise: the manufacture of injection moulding tools for technical components for the electrical and automotive industries. "Quality means to satisfy the customer”. WIRO is responsible for setting milestones in tool manufacture, e.g. through the development of new kinds of cooling and demoulding systems, the use of special steels and coatings, guaranteed cycle times, full documentation and a unique, comprehensive service. Between 80% and 90% of WIRO's production now goes to export, serving customers in over 73 countries, in 9 of which the company maintains a sales office. Since 1985, the number of people employed at WIRO's head office in Olpe has remained constant, at between 30 and 35. So far, over 100 junior staff have learnt their craft at WIRO, many of them now forming part of the company's core team.